Remnants of The Tapeworm Railroad Can Still Be Seen, But Have You Heard Its Meandering Past? Look at a map of the railroads through Gettysburg. They go north, east, and west, but no tracks head south toward Maryland. “Far” is a relative term in this context because no train ever traveled on the Tapeworm, and no rails were ever laid. However, the route was surveyed and graded in Adams County, which is further than two earlier railroads got. In the early decades of the 19th century, the railroad was the newest mode of transportation. Though a new technology, it held a lot of promise. You could travel faster than a wagon on a toll road, and you weren’t dependent on a steady, flowing water source like a canal. The construction of the Mauch Chunk Switchback Railroad in 1827 showed the country how useful railroads could be. The following year, the more ambitious Baltimore and Ohio Railroad broke ground in Baltimore. “The Pennsylvania legislature chartered 17 railroads in the next three years, and in the 1830s authorized 136 more lines—only 20 percent of which were actually built. Every community, it seemed, believed that prosperity was just around the corner—if only a railroad came its way,” according to the Pennsylvania Historical and Museum Commission. State Representative Thaddeus Stevens and the Adams County business community also thought that way. “Thaddeus Stevens and Adams County wanted to jump on the bandwagon because they saw the railroad as a means of economic development for the area,” Hoch says. Stevens, a Gettysburg lawyer, would eventually become known as a staunch abolitionist and a supporter of free education. He had shown that he wasn’t opposed to some “sleight of hand and skullduggery” to get what he wanted. He was first elected to the Pennsylvania Assembly in 1833, and he began working toward getting a railroad to come through Adams County, no matter what it took. When the Second National Bank in Philadelphia was seeking a state charter to stay viable, the bank was willing to pay the commonwealth a lot of money to ensure that it happened. When the charter came before Stevens’ committee in the state legislature, he had written into it that the Canal Committee would survey a railroad from Gettysburg to a location west of Williamsport, Md., where it would connect to the Chesapeake and Ohio Canal. Also, he had added that the bank would pay $200,000 for this. “Stevens was able to weasel $200,000 out of the bank and the legal authority to spend it on a railroad,” Hoch says. The charter was approved on Feb. 18, 1836. The surveying of a route over the mountains and south into Maryland began. Stevens’ less-than-transparent methods earned him lots of critics who were quick to point out that the Gettysburg Extension of the Pennsylvania Main Line did more to make contractors rich, create unnecessary jobs, and buy votes than it did to create a viable rail line. The final route selected was very serpentine (it took 35 miles to travel 18 miles between Stevens’ Maria Furnace near Fairfield and the Main Line). Stevens’ critics dubbed the convoluted railroad, The Tapeworm. It apparently needed to be done this way to get over the mountain without the use of an inclined plane. Using the surveyed route, trains should have been able to pull 90 tons of freight up the mountain at 10 miles per hour without the use of an inclined plane. Stevens was criticized that the twisting route was laid out to benefit his iron furnace. Hoch points out that Stevens owned three iron furnaces at different times. Two were in the Caledonia area, and one was near Fairfield. The Tapeworm route ran through the Maria Furnace property near Fairfield. However, that furnace ceased operation in 1837. Hoch says that Stevens would have benefitted from the railroad, but it would have been in the same way that any business near the track would have. Transportation costs would have been lowered for those businesses, and they would have become more competitive with other businesses that were located near transportation lines. In 1838, Democrats took control of the state legislature in a bitterly contested election that saw armed Democrats marching on the state house. Stevens found himself in the minority party and lost much of his support for the railroad. “Laborers and masons picked up their tools and walked away from Stevens’ only partially built line, leaving embankments, cuts and fills, and bridges unfinished,” according to the Pennsylvania Historical and Museum Commission. Stevens, as a canal commissioner, had also authorized the government to spend much more than budgeted for the project. The 63-mile line had been estimated to cost $750,000 to survey and grade and $400,000 to lay track. “Pennsylvania spent $750,000 on the initial miles of grading, and never laid an inch of track,” Hoch says. The final cost was $766,127 with very little to show for the expenditure. When the property was offered for sale in 1842, no buyers came forward. It wasn’t until 1853 that the Western Maryland Railroad took over the property, and they didn’t do anything with it until 1885 when a line using much of the Tapeworm route was built to Orrtanna and then Highfield, Md. Stevens eventually overcame the stain the Tapeworm had on his reputation. He was elected to Congress in 1849 where he began to earn a national reputation. However, even as a congressman, he was a consistent supporter of railroads. Although the Tapeworm Railroad was never built, Hoch says there is evidence that the graded route “may have acted as a trail or guide for the Underground Railroad.” He was given a tour years ago of some of the houses that would have been near the Tapeworm had it been built. Inside these homes, he was shown hidden rooms where slaves traveling on the Underground Railroad could have hidden. 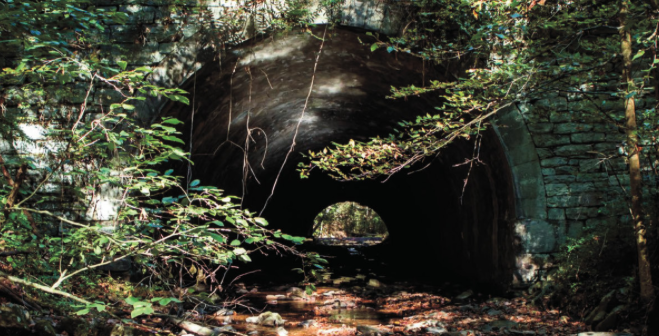 Today, there are still remnants of the railroad that can be seen in Adams County. Perhaps the best known is the McPherson Ridge railway cut, which was the location of some of the first day’s fighting during the Battle of Gettysburg. 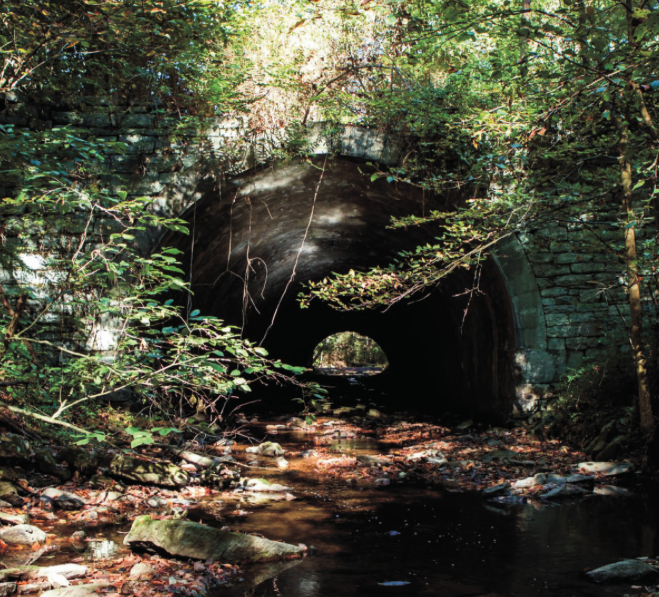 Other artifacts that remain are a single-arch bridge over Toms Creek near Iron Springs, a viaduct at Virginia Mills, a cut near Marsh Creek, a railbed near Willoughby Run, and the Seminary Ridge railway cut.